Although he is a qualified engineer, Chef Richard followed his parents’ footsteps and entered the famous Filipino kitchens of Max’s Restaurant. Richard or Chai, to his friends, has a Bachelor of Science degree specializing in Civil Engineering. He is a graduate of the Technological Institute in the Philippines. Combining a love for cooking with the practicality of science, Chai’s career has seen him win a number of accolades across his decade-long career with Max’s restaurant including a special award for food safety. However, his greatest moment of pride was when his dish won over the finickiest of critics; his 6 year-old daughter! When Max’s was brought to the UAE, Chai was chosen to help the team in maintaining the high quality standards of the food. For him, bringing Max’s to UAE was like planting the Philippine flag in the UAE culinary map. Chai believes that Max’s UAE has brought Filipinos closer to home. You are a qualified engineer. What inspired you to change your career path? While still in the Philippines, the Max’s Commissary (central kitchen)was recruiting engineering graduates as part of their management team. I was assigned to the production department and it was there that I fell in love with my job and discovered a new passion for cooking after which I decided to undergo short course in culinary arts. Did this change in choice of career upset your parents? My parents weren’t upset nor surprised as both my parents also worked for Max’s, so they were supportive. Please give us a glimpse into your career as a chef so far, and how you came to your current position at Max’s. I was hired as a management trainee to look after the engineering side of mass food production. I was also exposed to restaurant operations while doing store visits. My 10 years of experience has taken me from Management Trainee to Assistant Production Supervisor, Production Supervisor,Senior Production Supervisor and Production Manager. Since the past two years, I worked as Sous Chef overlooking the Max’s UAE central kitchen. 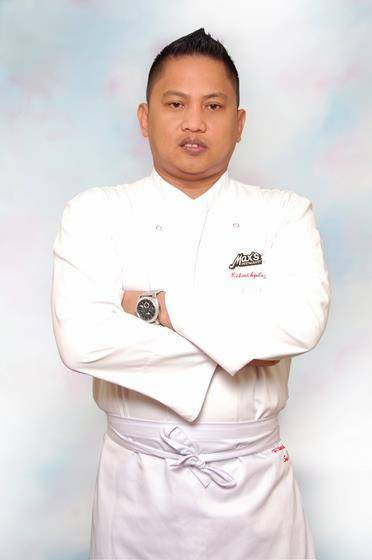 I currently assist the Max’s Brand Chef & manage kitchen operations across the UAE. You won an award for the Best Meat Processing Plant in AA category for both the Regional And National Finals. Please elaborate on this. This award is bestowed by the ‘National Meat Inspection Service’ in the Philippines. In accordance with their set ‘Food Safety Policies’ , this governing body conducts quality assurance audits in all meat processing plants. For the regional finals, we competed against 10 meat processing establishments. We eventually won the National Finals competing against 13 regional finalists. From your background in food and safety, what are the practices you have brought into the kitchen at Max? Since the Food Authority of the Dubai Municipality implements strict Food and Safety policies, we just improved a little on our monitoring and traceability. We conduct timely internal audits to make sure all our stores adhere to the food safety standards. What to you are the greatest challenges of being a chef? The greatest challenge for me as a Chef is that, I sometimes miss important life occasions with family and relatives. Even during sad moments, as hospitality professionals, we still need to delight and make our customers happy with every dish that we serve. What are the biggest perks of your job? To come up with innovative ideas and creativity in cooking is perhaps one of the biggest perks for me. The food industry never drops. It is always booming and a Chef has a many opportunities for development. What is your favourite traditional dish from the Philippines? It has to be the Kare-Kare. This delicacy is best described as a rich Beef and Vegetable dish of oxtail and tripe simmered in thick peanut sauce and served with shrimp paste. Of all the dishes you have created so far, which one dish has been your most memorable? The memorable dish that I created, is the one I cooked for my daughter who was 6 yrs old at the time. She was not a fan of vegetables , specially broccoli. I prepared a delicious dish of chicken & broccoli with coconut milk stew. At first, it was quite a struggle to convince her to try the food. You could see the disappointment on her face. But the moment she had her first bite, she looked at me and rewarded me with the most sweetest smile I had ever seen and her 2 thumbs up signalling she loved it. Which celebrity would you like to entertain at your restaurant, and what will you be serving? If given a chance, it would be a great Honour to have His Highness Sheikh Mohammed bin Rashid Al Maktoum at Max’s Restaurant. I would serve him the best Max’s Fried Chicken, our premium Bulalo and Crabmeat fried Rice. We could probably talk about his horses as I’m a horse racing fan too. Posted in Meet the Chef, People and tagged chef, chef talk, dubai, filipino, food, Interview, philippines, UAE. Bookmark the permalink.